Spray 5- to 6-quart slow cooker with cooking spray. In medium bowl, mix pasta sauce, tomatoes, crushed red pepper, bell pepper and zucchini. Spread 1 cup tomato mixture in bottom of slow cooker. Layer 3 lasagna noodles, broken into pieces to fit, over sauce in slow cooker. Spread half of the ricotta cheese over noodles; sprinkle with 1/4 cup of the mozzarella cheese and half of the spinach. Top with one-third of the tomato sauce mixture (about 1 1/2 cups). Repeat layering of noodles, cheeses and spinach. Top with remaining 3 noodles and sauce. Save remaining 1 cup mozzarella cheese in refrigerator. Cover; cook on Low heat setting 4 to 5 hours or until noodles are tender and cooked through. Sprinkle with reserved mozzarella; cover and let stand 10 minutes to melt cheese. You can make this recipe up to 24 hours ahead of time. Assemble the lasagna, cover tightly with foil and refrigerate in the slow cooker insert. Cook time will take longer; cook until heated through in center. 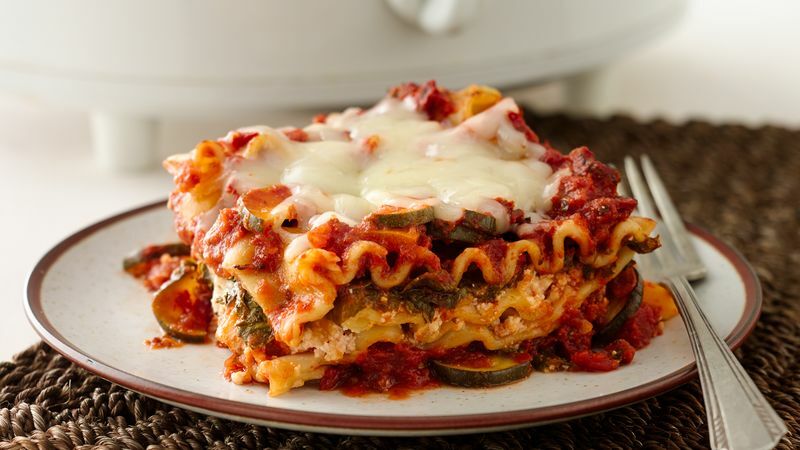 Try other vegetables you like in the lasagna: sliced mushrooms, yellow squash, thinly sliced red onion, grated carrots or green bell pepper.